Materials for Flexible Printed Wiring Boards | NIKKAN INDUSTRIES CO., LTD.
NIKKAN was one of the first companies to focus on thin, light flexiblewiring boards suitable for lighter and smaller electronic devices, and became .lapanl s first manufacturer to succeed in mass-producing materials for flexible printed wiring boards. Since then, the excellent quality of our products has been recognized throughout the world. 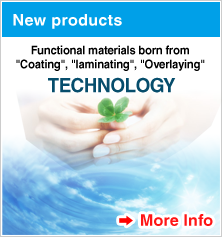 The Laminated Products Department handles materials for flexible wiring boards that are suitable for downsizing and higher performance of electronic devices since they are thin and light, and more importantly, flexible. The product lineups include copper-clad laminates (CCL) for flexible wiring boards, cover layers (CL) and adhesive sheets as well as rigid-flexible compatible materials, a combination of FPC and rigid boards, thus allowing us to meet diversified user needs. All of these products are manufactured at our production subsidiary Takahagi Nikkan Co., Ltd., which has acquired ISO9001 certification, to ensure a structure to provide high-quality products.